Any season is perfect for a bake sale. Who doesn’t love this sweet way to raise money for your class, organization, athletic club or favorite charity? Luckily, there are simple steps you can take to make your event a huge success — from whipping up a creative theme to ensuring you have plenty of treats for the big day. A bake sale is only as successful as the sugary inventory you have on the table. Try a few of these ideas to recruit participants, and let the fun begin. Organize a Baking Day - Gather friends, family and the kids to spend a day baking until you drop. Decide on recipes in advance and divvy up the ingredients. This is a surefire way to be ready for the sale. Plus, your house will smell amazing! 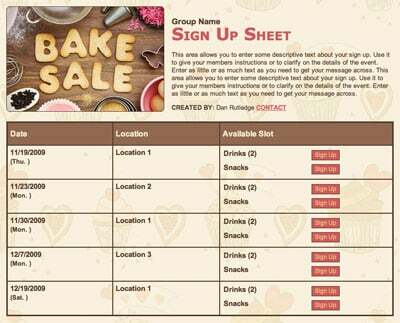 Create Sign Ups - Invite people to participate in the bake sale and inspire them to put on their cooking thinking caps with a bake sale sign up. It’s easy! Input desserts (cakes, bars, cookies, etc.) and the quantity needed and email the list to volunteers. Use a Secret Ingredient - Assign each class or team a signature baking ingredient or flavor. First graders can be all about chocolate, second graders get creative with cookies, third graders sprinkle it up and so on. Recognize grade or team winners for using the secret or signature ingredient in creative or delicious ways. Make It a Contest - Let eager bakers know awards and bragging rights are at stake for the most creative dessert, tastiest cookie, tallest frosting topping, best presentation or gooiest brownie. Winning categories are limited only to your imagination. Timing is Everything - Young chefs and their parents might be more apt to contribute a sweet treat to the sale if they are already in the kitchen baking up a storm. Consider holding your sale close to the Fourth of July, end of school parties or the holiday season. Wield Star Power - Ask a local celebrity (local news anchor, semi-pro athlete, school principal, etc.) to judge a sample of baked goodness and declare a winner. The opportunity to rub elbows with a popular personality might be enough to keep the treat donations streaming in. There’s nothing like a bake sale theme to get creative juices flowing. Gather inspiration below, then ask the committee or participants to vote on a favorite idea. Style counts — buyers will be attracted to a well-decorated table that shows off your theme. Cupcake Wars - Ride the cupcake popularity wave and get ready to duke it out with tasty cakes and sugary frosting. Create a yummy sports-style elimination bracket and ask judges to taste and rank the best cupcake until it gets down to the final two. Fruity Fun - Beat the summer heat with a fruity fun bake sale. Bring on the pineapple upside down cake, strawberry cupcakes and key lime pie! Taste the Rainbow - Add a splash of color with a “taste the rainbow”-themed sale. Lemon pound cake, blueberry strudel and confetti crispy bars will brighten the table and put a smile on the faces of eager eaters. Around the World - Showcase desserts from around the world at your next bake sale. Serve up flan, baklava, cannoli and other sweet treats from across the globe. Happy Holidays - You don’t have to wait for a holiday to partake in your favorite treats. Celebrate Christmas in July with sugar cookies, gingerbread and peppermint-flavored goodies or make people smile with Valentine-themed confections in the fall. Sugar knows no season! Carnival Ride - Need a break from brownies and bars? Get creative with a carnival theme. Buyers will love digging into popcorn balls, churros and anything with animal cookies! This sale pairs perfectly with a school festival. Tiny Treats - Perfect for a preschool or kindergarten bake sale, ask participants to create miniature versions of their sweets. People will love to get their fingers on bite-sized brownies, tiny cupcakes, mini pies and more. The smaller the dessert, the more you can try! Inspired by a Book - Whip up fanciful desserts found in favorite stories, like Turkish delight from The Lion, the Witch and the Wardrobe or chocolate frogs from Harry Potter. These sweets can go hand in hand with a book fair. Breakfast Bake Sale - Stick to morning goodies with this theme, and have participants contribute muffins, cinnamon rolls, doughnuts, even creative waffle concoctions. Family Cookbook - Cook up both delicious treats and nostalgic memories with this theme. Ask bake sale participants to bring their favorite dessert that has been passed down in their family and you’ll have a smorgasbord of yummy traditions. Smart Cookies - A classic and easy-to-make treat, cookies can be as simple or as elaborate as you desire. Ask people to bring a variety of cookie creations — from Girl Scout-inspired cookie recipes to icing-laden cookie cakes. Three Ingredient Treats - Keep things easy as one, two, three by only selling baked goods that were made with three ingredients. Who knows, maybe someone will discover a new combination that will become the next s’more! You’ve got the goodies, the volunteers and the perfect theme, so now it’s time to figure out the best place to hold the sale. Below are a few suggestions to get you started. Remember, if you have the volunteer power, you can satisfy those with a sweet tooth in more than one place. Rise and Shine - Early birds (and their parents) will appreciate finding your table of sweet offerings first thing in the morning at the start of a soccer game, track event, swim meet or another sporting event. Consider upping your earning potential with a coffee stand. Festival or Community Event - Find an upcoming community event and ask organizers if they would be willing to let you join in the fun with a bake sale. This is a great opportunity to promote each other’s events. Double the promotion, double the customers! Local Shops and Stores - Go local and ask if a jewelry store, stationary shop or clothing boutique will let you have some space in front of their store for a few hours. Be sure to have information about the club, organization or activity your funds are supporting at the ready. Church or Religious Organization - If you or someone you know belongs to a church or religious organization, see if you can score a spot after services. Hungry patrons will be glad you are there! Neighborhood Stand - Neighborhoods are a great place to have a “drive-thru” bake sale. Create an easy-to-read menu so drivers can order quickly and take their treats on the run. Be sure to observe traffic rules and, of course, safety first. Library or Bookstore - Ask your local bookstore if you can make their next book signing or story hour a little sweeter with a bake sale. Also, consider asking your local library if you can set up shop for a few hours and offer to give back a portion of the proceeds. You’ve got your sweet goods at the ready and now it’s time to spread the word. After you set the date and location, get the committee together and brainstorm how to let the community know about your sale. Try these ideas to get you started. Offer a Discount - Distribute coupons before the sale good for $0.10 or $0.15 off smaller items or $1 off on larger cakes and pies. Remember to put the date, time and location of the sale on the coupons. Share a Recipe - Post a recipe featured in your bake sale on neighborhood websites, posters and fliers. 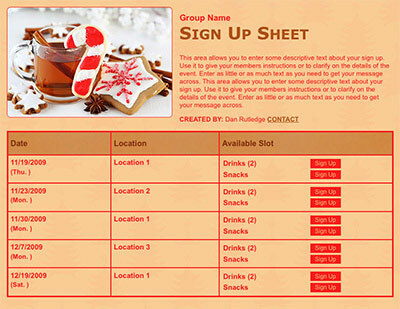 Let potential customers know when they can line up and taste the homemade goodie in person! Give Free Samples - Everyone loves free samples! A few days before the sale, tempt future customers with a bite of your sweet treats. Take pictures of the samples and post on your favorite social media outlets. Get Social - Use the big world of social media to share the news about your upcoming sale. Post pictures on Instagram, Twitter, Facebook and other popular social media outlets — and don’t forget to tag, tag, tag! If your sale is benefitting a local organization or cause, post on those pages as well and include a link. Try TV and Radio - Consider contacting the local radio and television stations to let them know about your event. 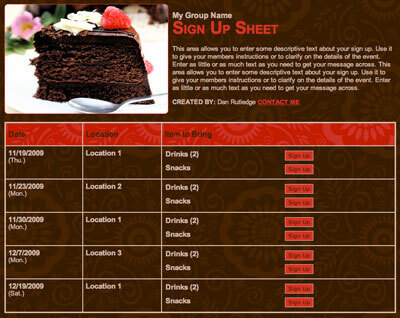 They might include the information on an online community calendar or give your group a free shout out. Invite media personalities to come by the sale and say hello! Create a Character - Make the bake sale extra fun by creating a character to promote the big day. Give Carla the Cupcake or Bobby the Brownie a social media page where they can post about the sale, feature special treats and interview bakers. Now it’s time to get baking! Use these ideas to make your next sale a sweet success and delicious day for everyone. Courtney McLaughlin is a freelance writer in Charlotte, N.C. She gratefully shares her life, home and heart with her daughter and their dog. Organize bake sale volunteers with a sign up.